A few weeks ago, Monique of Mmmm! Nail Polish asked me to review a few of her polishes; of course I couldn't resist. Although Monique isn't working at the moment, she is using some of the profit from selling her nail polishes to send care packages to a soldier in Afghanistan whom she adopted. 2 coats of Tickle Me by itself, no top coat. 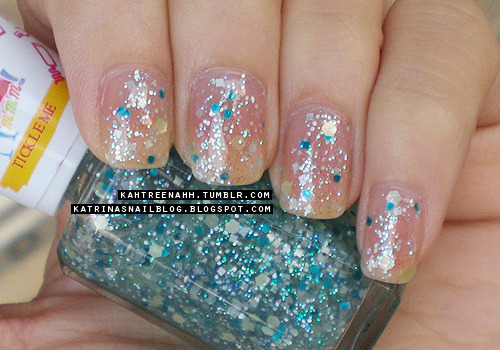 From what I can tell, its a clear base with tiny iridescent glitter, tiny white glitters, matte (?) square glitters, and bigger matte mint / lemongrass glitters. The iridescent glitters look like they're glowing in this pictures 8D I did have a to do a bit of fishing for the bigger glitters but this polish applied very well. 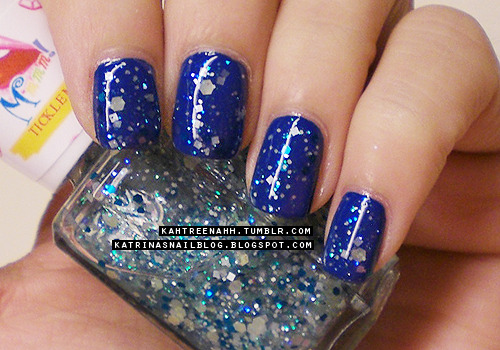 2 coats of Tickle Me over 2 coats of Finger Paints' Blissfully Blue + top coat. Absolutely adorable ~! 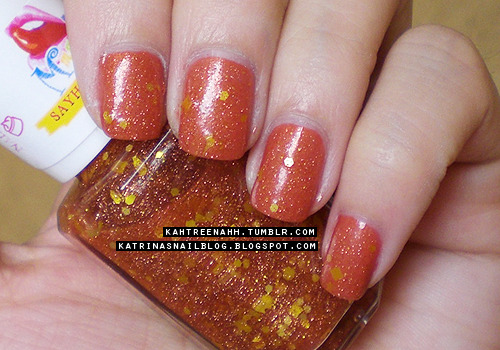 2 coats of Say Hi To Bob, no top coat -- clear base with lots & lots of tinyyyy burnt orange glitters with bigger yellow hex & square glitters. It does dry kind of matte but it applies well. 1 coat of Say Hi To Bob over 1 coat of OPI's Bullish on OPI, no top coat. Ugh. 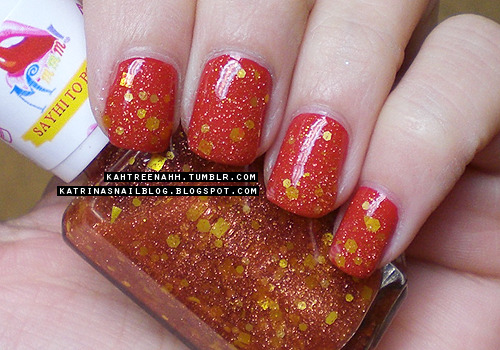 this was my favorite combo; its a perfect mani for fall. Seriously, pictures do not do justice. 1 coat of Say Hi To Bob over Finger Paints' Calligraphic Calico, no top coat. Pretty but not my favorite combo. See how matte / flat the polish dries? Top coat would've made it shinier but I skipped out on the top coat. 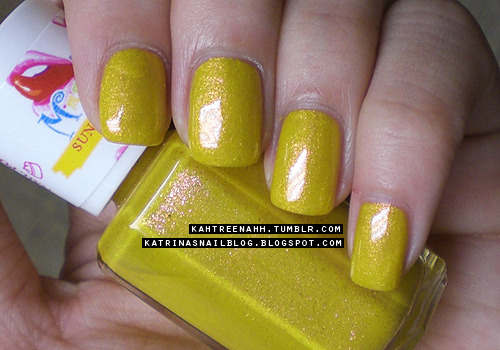 2 coats of Sunny Days + top coat. This was the closest I could get to a color accurate photo -- the polish leans more mustard yellow with bright orange-y / pink duo / shimmer. The shimmer is much more visible irl. Formula on this one is a bit thick too but its definitely easy to work with. 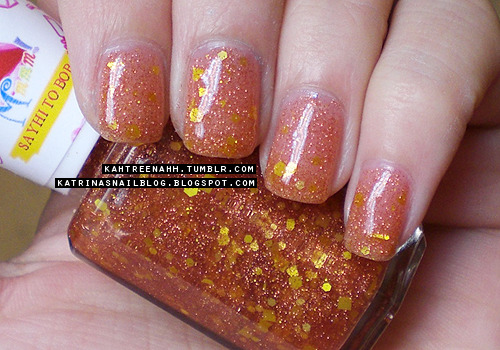 1 coat of Sugarlicious + top coat. OMG. RIGHT!? Olive-y green base with bright green duo / shimmer. Kinda thick formula as well but thin coats cover very well. OMG! All of the colors looks really MMM! The layering versions are super pretty! Gosh! These are great! I am drooling over I'm Taken! I do wish her well with her great program on doing care packages for troops in Afghanistan. I bet she could find a sponsor to give her matching funds for what she earns. Keep us posted if she is going to start to produce polishes again. In fairness, these are really nice pieces of nail polish colors. I adore them all. Personal fave is the Calligraphic Calico. Yea, they're all really great polishes~ The colors are absolutely beautiful.